Weekend Wrap: Netflix; PlayStation 4; House of Marley; Sony and Napster | What Hi-Fi? We start with Netflix and the news that it has announced the first major update to its TV application since 2013. Now when you select a movie or TV show to play, key information such as episode number and the synopsis will be displayed over the top for a few seconds. 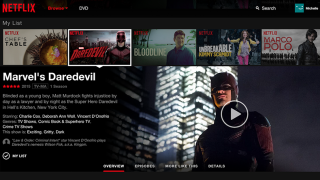 Netflix says this will provide a more fluid user experience, as opposed to a static one, and allow viewers to decide if they want to continue watching or move on to something else. Netflix has been trialling the feature with randomly selected viewers since January 2015, so for it to receive a universal roll out, the feedback must have been positive. The PlayStation 4 will soon be getting an official universal remote. The new remote will be made by PDP (Performance Designed Products) and is expected to fetch a $30 asking price when it’s released in North America in the autumn. A European release is expected for Q4 of 2015, but it is “still to be confirmed”. The remote will allow users to control media playback functions via Bluetooth and can also control up to four devices. A dedicated PS4 Home button will also allow users to switch between apps without having to turn on a DualShock 4 controller. House of Marley has announced three pairs of headphones that use a new blended bio-plastic housing. Little Bird and Mystic (both £12.99) are in-ear headphones that are said to deliver “the perfect balance of sound, style and craftsmanship". They feature 9.2mm drivers and a noise-isolation design for “sophisticated and crisp sounding music". Little Bird will be available in Black, Rasta, Peach, Navy and Cream finishes while Mystic will come in Black, Rasta, Grey, Green and Turquoise finishes. Both pairs are available now. The Roar on-ear headphones also make use of the new blended bio-plastic material and feature 40mm drivers. An in-line microphone can be found on the cable along with a one-button controller for play/pause functions. The Roar will be available now in Black, Rasta, Grey, Navy and Pink finishes for £30. Other new products from House of Marley include the Chant Mini and Chant BT wireless speakers. The Chant Mini has a 2in active/passive combo driver that delivers 3W of power. It has auxiliary and RCA inputs and a built-in microphone for hands-free calls. Continuing with Marley’s use of eco-friendly materials, the Chant Mini uses blended eco-plastic and aluminium housings with natural bamboo detailing. A built-in rechargeable battery claims to offer six hours of playback. The Chant Mini is available now in Black, Navy and Blue Hemp finishes for £40. The Chant BT meanwhile costs £60 and benefits from a 2in driver with 2in passive radiator, delivering a total output power of 5W. It too has aux and RCA inputs, as well as a speakerphone function. It uses the same eco-friendly materials and is available now in Black, Navy and Blue Hemp finishes. Sony is launching a new concept operating system for the Xperia Z3 smartphone in Sweden. The project, appropriately titled “Concept for Android” will be available to 500 Z3 users in Sweden who register their interest on the Xperia Lounge app. The new OS is said to have a more “stripped back, vanilla Android look and feel”, as well as having the most popular Sony features and apps. Maybe we could soon see the end of bloatware? Sony says the initiative is primarily to receive feedback and ultimately improve the overall user experience, not only for the Xperia Z3, but for future Sony smartphones too. Napster has seen its fastest growth period in the past 12 months, increasing its customer subscription base from two million accounts in the summer of 2014, to three million in 2015. Other impressive numbers from the music streaming service include mobile usage up 60 percent on last year and offline listening increasing by 40 percent over the last six months. Napster was also the first music service to introduce Audio Cards, allowing artists to post fully-licensed music to Twitter. Artists including Mariah Carey, Wiz Khalifa and Fifth Harmony have all made use of the service. Introduced earlier this summer, Napster’s Music Inbox service has delivered over one million personalised music recommendations to users. Gaining one million new subscribers in the past year has been no mean feat, especially with the emergence of two big streaming services: Tidal and Apple Music.